Ms. Ruby Doris Peterson, daughter of the late John Malloy and Mamie Malloy, was born April 19, 1930 in Hamlet, N.C. She departed this earthly life to eternal rest on Monday, September 10, 2018 at Genesis Healthcare in Pembroke NC. She attended school at Red-Stone in Lumberton, NC. Later, she married the late Charles Peterson, and to this union six children were born (four boys and two girls). 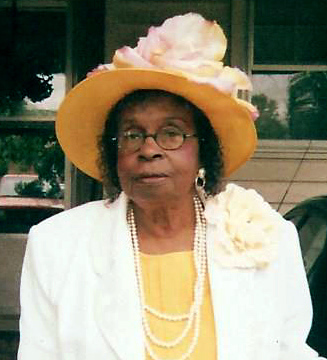 She joined First Baptist Church at an early age, and was an active member of the Ladies Usher Board, and a missionary. She was employed by Converse, Kendall’s, and with the Robeson County Public School System. Ruby enjoyed sewing, planting flowers, and decorating for every holiday and occasion. She enjoyed helping others, visiting the sick ,and just visiting people in general. She would take people to their doctors appointments and take them to take care of their business. She was just a phone call away if you needed her. Ruby was preceded in death by her parents, two sisters, Ruth Pittman and Barbara Jean Allison, one son, Charles E. Peterson, one daughter, Charlene Peterson, one nephew, Robert Pitman, and five brother-in-law's. She leaves to cherish her memories three sons, Donald C. Peterson (Tronto), of Lumberton, NC; Reginald K. Peterson (Wanda) of Greensboro, NC; and Alonzo Q. Peterson (Paula) of Eaglesville, TN; one daughter, D. Priscilla Carter of Lumberton, NC; five sisters, Louise Johnson and Mary Addison both of Fayetteville, NC; Marilyn Simmons of Hyattsville, MD; Rosie Robeson of Wake Forest, NC; and Mildred Ann Culp of Lumberton, NC; one brother, John Malloy Jr. (Louise) of Wake Forest, NC; seventeen grandchildren, thirteen great-grandchildren, and six great-great-grandchildren. A special granddaughter Paula M. Peterson Campbell, and a host of nieces, nephews, cousins, and other relatives and friends.